This 137-year old grand monumental Goethic structure has a moderate beginning. 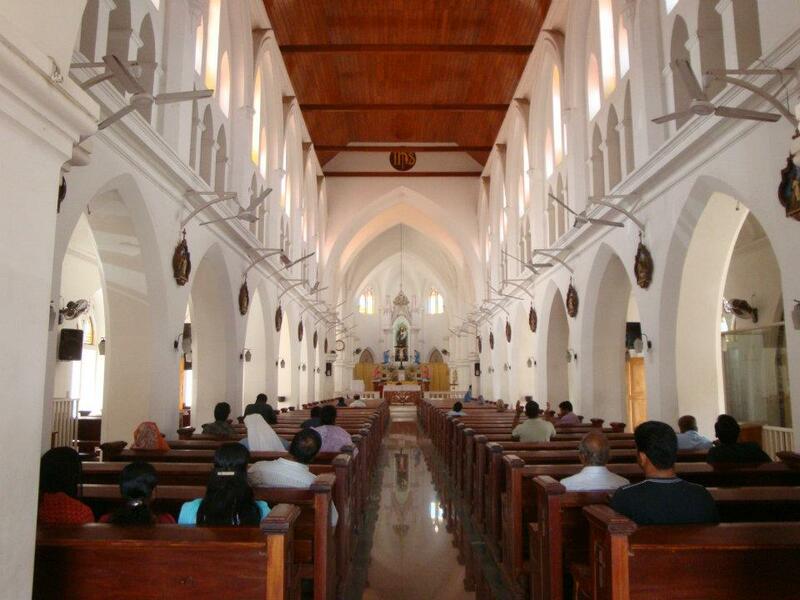 The initial Church was constructed in 1873 as a Parish Church to look after the spiritual needs of a few Catholic military men and a few Catholic families who mainly migrated from the coastal region of earstwhile Travancore state, comprising of the present Kanyakumari and Trivandrum Districts. The very name Palayam has its ethymological meaning a ‘Contonment’ ie, the Military’s residence. On May 4th, 1873 the first Church was blessed by the then Bishop of Quilon Most Rev.Eldaphonese OCD and Rev.Fr.Emygdius OCD, the Parish Priest. The Second phase of extention work in the manner of the Cross was done in 1912 during the tenure of Rev,Fr.Pamcratius OCD. And the final stage of extention, including the Goethic style imposing front and the bell-tower was completed in1927 during the time of Rev.Fr.Ildaphonse OCD. The three ‘Do-Re-Me’ syncronising bells were brought from Belgium and were installed. These bells were named Joseph, Xavier, and Aloysius to denote St.Joseph the Patron of the Church, St.Francis Xavier, the Apostole of India and Bishop Aloysius Maria Benziger the pioneer Missionary-Bishop of Quilon respectively. When the Quilon Diocese was bifurcated and the new diocese of Trivandrum was formed on 1st July 1937, St.Joseph’s Church became the Cathedral Church of the newly formed Trivandrum Diocese. And when His Excellency Rt. Rev. Dr. M. Soosapakiam was made the Archbishop and the Diocese of Trivandrum became the Metropolitan Archdiocese of Trivandrum in 2000, St.Joseph’s Cathedral was also raised to the status of the Metropolitan Cathedral.